MELVILLE, N.Y.--(BUSINESS WIRE)--Verint® Systems Inc. (NASDAQ: VRNT) today announced substantial enhancements to its Verint Workforce Optimization™ software designed to help contact center, back-office and branch operations better manage the performance of employees and operations. Armed with a brand new user experience and analytics, this latest release includes innovations in performance management to help organizations gain even greater insight into how employees are performing, how well goals are being met and how to better engage and take action on these insights. This latest release features a new state-of-the-art user interface that supports advanced visualization, data exploration, and analysis of employee and company-wide performance, providing critical executive insights that support time-sensitive decision making and actions. 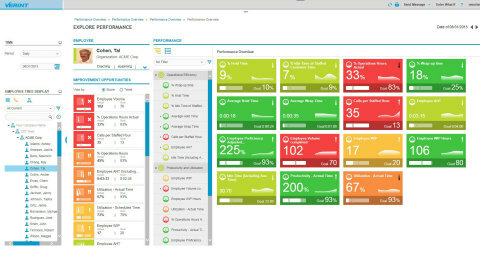 The enhancements also enable managers to work more effectively with the addition of new flexible scorecard widgets and dashboards. Likewise, employees benefit from a more intuitive performance scorecard and greater visibility into their individual metrics and achievement of goals. This press release contains "forward-looking statements," including statements regarding expectations, predictions, views, opportunities, plans, strategies, beliefs, and statements of similar effect relating to Verint Systems Inc. These forward-looking statements are not guarantees of future performance and they are based on management's expectations that involve a number of risks, uncertainties and assumptions, any of which could cause actual results to differ materially from those expressed in or implied by the forward-looking statements. For a detailed discussion of these risk factors, see our Annual Report on Form 10-K for the fiscal year ended January 31, 2015, our Quarterly Report on Form 10-Q for the quarter ended October 31, 2015, and other filings we make with the SEC. The forward-looking statements contained in this press release are made as of the date of this press release and, except as required by law, Verint assumes no obligation to update or revise them or to provide reasons why actual results may differ.